I remember the first time I saw the Barred Fruiteater (see full article here). I was walking the Black-breasted Puffleg trail at Yanacocha Reserve when I heard some rustling in the tree above me. It was a female. I could see some movement but it was the bright orange beak and feet that helped me recognize that it was something other than the breeze affecting the leaves. She was about 6 feet over my head, sitting quietly amongst the damp moss. My position was not the greatest for observation or photography but I was afraid any sudden movement would send her on her way. So I watched and enjoyed the moment as the morning dew dripped on my neck and trickled down my back. 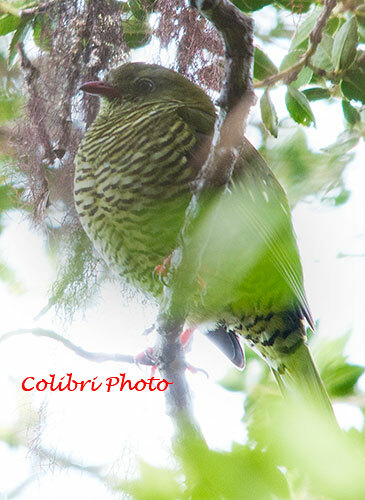 The Barred Fruiteater prefers the high altitude rainforest of the Andes Mountains, hiding amid the damp leaves and moss at mid heights. It is not an exceptionally active bird so it is difficult to spot in its surroundings. It is one of those species whose habits and environment need to be studied before you can point it out to someone else. Many times people will walk past, not noticing this beautiful inhabitant eyeing them from a safe perch. 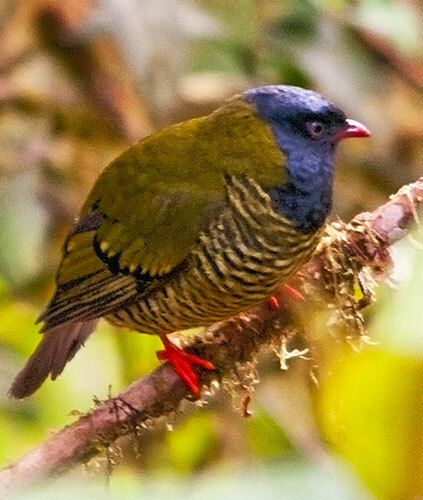 Although the Barred Fruiteater can be found on both the eastern and western slopes of the Andes, I do not recall seeing it anywhere other than at Yanacocha during my explorations. There I have seen it on several occasions, generally back near the hummingbird feeders prior to the tunnel. They were not at the feeders themselves but in the heavy foliage along the paths leading from the area. I enjoy birding in the company of others, either while guiding or just out observing with friends. But there are times when it is advantageous to bird alone. The first time I saw this handsome bird was one of them. I believe that had I been with someone else I might have missed seeing this beauty. Since then I have been able to share this experience with others by know what and where to look for this illusive bird. Places where you can observe the Barred Fruiteater are Guango Lodge & Reserve, Huashapamba Forest Reserve, Podocarpus-Cajanuma, San Isidro Reserve, Tapichalaca Reserve, and Yanacocha Reserve.